The St. Mary's River drains a landscape, which, geologically, originated on a continent apart from North America, likely either Africa or South America. About 400 million years ago this fragment of landmass, which presently comprises much of southeast Nova Scotia, collided with eastern North America and was "welded" onto the North American continent. This fragment, called the "Meguma Terrane" differs geologically from other areas of the province and is composed primarily of sandstones and shales. It is here that we find quartz seams containing gold. Goldenville, Cochrane Hill, Crow's Nest and Wine Harbour are communities with rich gold deposits. The geological groundwork is interrupted by faults and these faults control the drainage patterns within the watershed. 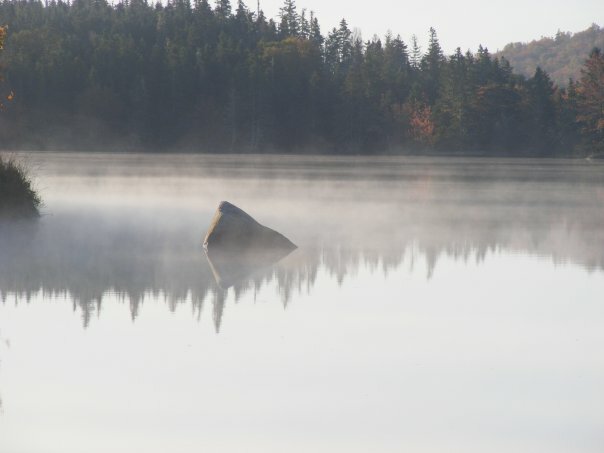 Lochaber Lake, in the headwaters of the North Branch, lies within one of these faults which results in it being a deep lake (by Nova Scotia standards) at 52 m maximum depth. The landscape of the watershed was historically Acadian Forest made up of red spruce yellow birch, balsam fir, sugar maple, red pine, eastern white pine, eastern hemlock and American beech. It has been converted over time to one dominated by softwoods and with clearings for agriculture in the flat river valley bottoms. The landscapes vary from rolling hills to relatively steep terrains and from treed to barrens. Wetlands are dispersed throughout the watershed. The St. Mary's River watershed is used by a wide variety of fish and wildlife. Approximately 20 species of fish are documented to occur in the lakes and rivers of the basin, including the recreationally pursued Atlantic salmon, brook trout, gaspereau (alewife), American eel, rainbow smelt, and yellow perch. Coarse fish, such as white sucker and minnows are also abundant. Wildlife within the area include that typical of northern Nova Scotia (whitetail deer, black bear, coyote, raccoon, etc.) as well as a wide variety of bird species. The St. Mary's River is also known to be home to the mainland moose and the wood turtle - both provincially recognized species-at-risk. Meet Mac, the big old snapping turtle & custodian of Silver's Run, a salmon pool just above Silver's Bridge on the St. Mary's River. He was photographed here by his long-time friend, Gilbert van Ryckevorsel. Fresh from the sea, Atlantic salmon rest at Harrison's Pool, West River St. Mary's.